Aradial AAA Radius Server has been servicing large and small ISPs since 1997. Aradial is a high performance RADIUS server with Tier 1 levels of reliability and scalability. Aradial supports the latest RFCs, vendor specific attributes, NAS templates and has a multitude of pre-configured settings that support most Access Servers in the market today. Aradial is based on a plugin architecture, which allows customizing the authentication and accounting logic, outside of the core product. Aradial AAA Radius server Runs on Windows, Linux and Solaris, and supports all databases. 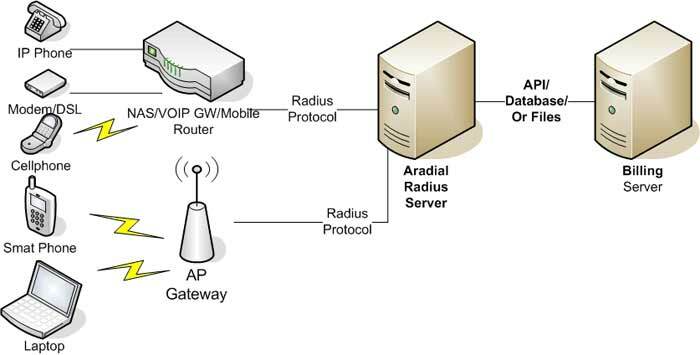 Aradial Radius server is integrated with top Radius server for Billing solutions for ISP billing, Wifi billing, Hotspots billing and VOIP billing server. Aradial Technologies main target customers are Tier 1 Level operators like large wire-line (ISP, ASP) and wireless service (Mobile) provides. Aradial Technologies AAA Radius server customers and partners include some of the world's largest corporations, institutions, telecommunications carriers, billing companies and internet service providers (ISPs). For Medium and small Internet service providers, we provide a similar solution based on the same technology. Hotspots Access points, Hotspots Access gateways, and Wireless Mobile (GPRS and 3G).